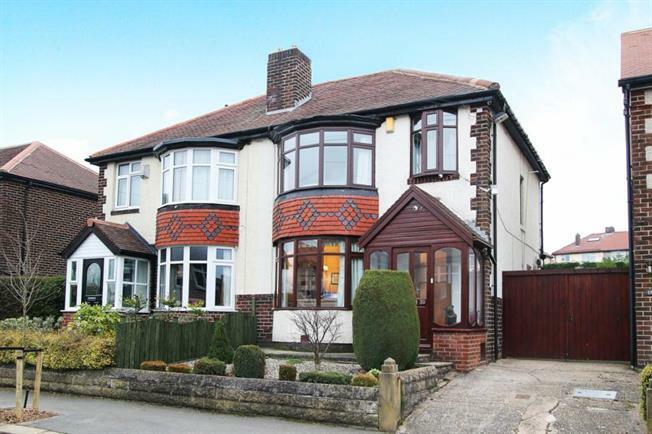 3 Bedroom Semi Detached House For Sale in Sheffield for Guide Price £295,000. A superb opportunity has arisen to acquire this well presented three bedroom semi detached family home located in the heart of this highly sought after superb of Sheffield, offering accommodation over two floors with further potential to convert the loft space already boarded with rear facing velux window (subject to necessary consents), the property is located at the head of a cul-de-sac, with the benefit of double glazing, GCH, off road parking, Garage and rear garden. Benefiting from double glazing, gas central heating & an attractive landscaped garden to the rear with shared driveway leading to a detached garage and separate brick built workshop/bike store. The accommodation in brief comprises: an entrance porch opening to the hallway with laminate to the floor stairs to first floor landing. A bay windowed lounge to the front has laminate flooring with decorative fireplace and gas fire, open through via to the dining via double doors, from the dining room French style doors access the conservatory and there is laminate to the floor. Conservatory overlooking the rear garden having wood grain effect uPVC double glazed side and rear facing windows, along with laminate to the floor and entrance door accessing the rear. Kitchen fitted with an excellent range of wall and base units with work surfaces incorporating a one and a half bowl sink with mixer tap and drainer unit, appliances to include Leisure multi fuel double oven with extractor fan above, along with space and plumbing for an automatic washing machine and fridge/freezer. First floor landing provides loft access being boarded with pull down ladder, power, lighting and rear facing velux window. On the first floor the master bedroom is carpeted and has bay to the front and built in wardrobes providing ample storage space with concealed lighting. Double bedroom two is carpeted with window overlooking the rear garden and having a range of fitted wardrobes to one wall with concealed lighting. Bedroom three has a front facing window with laminate to the floor and provides flexible accommodation as guest bedroom, study or nursery. To the exterior of the property is a shared gated driveway and garden area to the front. To the rear is a garden opening out from the property with central lawn leading to the flagged patio area providing an excellent outdoor seating and entertaining area. Location: Ideally located for the full range of superb amenities in Crosspool including well regarded local public and private schools, shops, super markets restaurants & public transport to the City Centre, Central Hospitals & Universities, as well as with excellent access to the surrounding countryside, Peak District and Trans Pennine routes. An early viewing is a must in this much sought after location.